Isla has another big day coming up. As I mentioned before, her cochlear implant for her right ear has been working out very well. As a result, Patty and I have decided that she will have the second implant for her left ear. The surgery is scheduled for this coming Monday. Even though we’ve been down this road before, we’re still nervous about any kind of hospital visit. This isn’t a decision we take lightly, but Isla loves being able to hear the world around her, (or at least the world to the right of her.) With the hard work of some amazing medical professionals, we’re confident that she will be able to experience so much more, such as that really boss surround sound system in the rumpus room. Patty has been absolutely amazing through all of this. While I’ve been posting “Simpsons” clips and writing about allegedly drunken Presidential candidates, Patty did something truly special for our little girl. 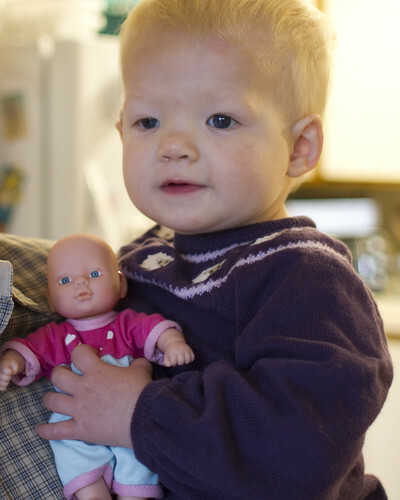 There are lots of dolls out there for all types of kids; dolls with glasses, dolls with wheelchairs, but Patty was unable to find a doll with cochlear implants. So she made one. 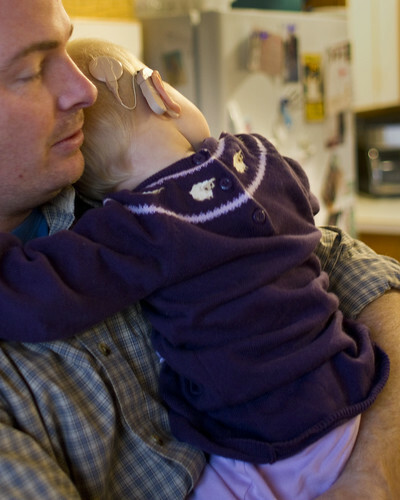 Using only puffy paint, a doll Isla picked out at Target, and her innate MacGuyver-esque talents, Patty painstakingly applied the paint to form two little cochlear implants on the doll. What a great mom!